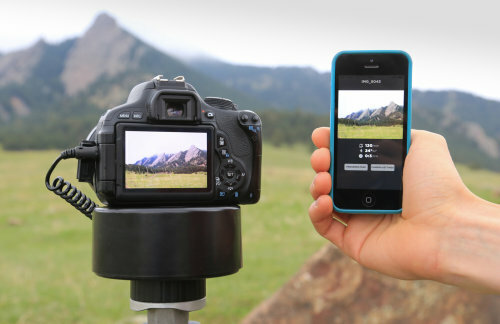 Alpine Labs has launched a Kickstarter campaign for its Radian 2 Bluetooth timelapse device. Like the original Radian, the new device lets you capture still, panning and tilting shots but the Radian 2 adds wireless connectivity. Radian 2. Remote control of pan and tilt. The Radian 2 receives Bluetooth commands from your iOS and Android phone or tablet and transfer them to the camera via USB. You can adjust aperture, shutter speed and ISO settings, the company said. The Radian 2 can also transfer thumbnails from the camera's memory card to your phone or tablet. Panning and titling are accomplished by means of the Radian's rotating housing and mechanical sliders that significantly increase the cost of this device over simpler remote-only control solutions like built-in WiFi/NFC. A $200 Kickstarter investment will get the housing alone, for example, while $780 gets a three-axis rig. The company plans to deliver the device in October. For more information see the news release below. SAN DIEGO -- Alpine Labs has returned to KickStarter for the launch of its second-generation motion time-lapse device. The Radian 2 enables Bluetooth wireless control of your camera from iOS and Android smartphones and tablets. The original Radian enabled users to create still, panning and tilting shots. The Radian 2 adds Bluetooth wireless connectivity so users can control camera settings from iOS and Android devices on the fly as well as a linear adaptor to use both the original Radian and Radian 2 for linear motion. After connecting an iOS or Android device via Bluetooth to the Radian 2, the USB connection from the Radian 2 to the camera passes commands to the camera to enable users to adjust aperture, shutter speed and ISO settings without touching the camera or the device. In addition, the Radian 2 can access the camera's memory card and send image thumbnails straight to your phone or tablet. If the thumbnails are not perfect, camera settings can be adjusted to address the situation. This is particularly useful during long time-lapses in changing light conditions. The platform is modular and enables you to add Radians as your ambition (and budget) grows -- you can now program up to three synchronized Radians at once to seamlessly combine panning, tilting and sliding. If the stretch goal for the KickStarter campaign is reached, Alpine Labs aims to add functionality to the app that allow you to compile a preview of the time-lapse on your phone as the lapse is being shot. "Everyone on the team is excited about the functionality that Radian 2 will give photographers interested in time-lapse photography," said Greg Horvath, president of Alpine Labs. "We have worked really hard to make motion time-lapse photography accessible to anyone with a camera. Radian 2 makes a big jump in this direction while also adding unprecedented creative control for a time-lapse device. The company plans to deliver all KickStarter units during October and has a history of successfully delivering on two previous Kickstarter campaigns -- the original Radian and Michron (a stationary time-lapse device). Radian and Michron have been used by BBC Earth photographers in a number of wildlife documentaries and short films as well as by renowned photographer Colin Delehanty while filming for Project Yosemite. Go to https://www.kickstarter.com/projects/alpinelabs/radian-2-bluetooth-time-lapse-motion-and-camera-co to visit the campaign page or to find out more about Alpine Labs, visit http://alpinelaboratories.com/.